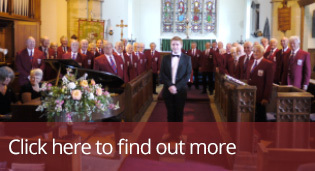 Based in the seaside town of Budleigh Salterton in East Devon, the Choir was founded in 1974, under the musical direction of Pamela Jones, now the Choir’s Life President. The current Musical Director is Michael Graham. The Choir exists to provide a stimulating and enjoyable hobby for its sixty or so members. It performs 8 to 10 concerts a year around the region, most of which are for the benefit of local and national charities. Recent beneficiaries include Hospiscare, MacMillan Nurses, Rotary and Lions Clubs, Cancer Research, Devon Air Ambulance Trust and numerous church development funds. The choir is delighted to sing for these worthy causes. We are always looking for new members and rehearse on Tuesday evenings in the Peter Hall, Budleigh Salterton from 7.30 to 9.30 pm. The choir is being encouraged to a new level by Musical Director, Michael Graham. Michael is a organist and Director of Chapel Music at Exeter University and a Lay-vicar at Exeter Cathedral. He trained at the Junior Royal Northern College of Music, and has held organ scholarships across the UK, before coming to Exeter. We have a repertoire of over 150 songs, and over the years and have sung in many venues around Devon and at locations in Kent, South Wales, Yorkshire, France, Belgium and Holland. The choir sang alongside 12 other choirs at the Anglo-Welsh Festival of Male Choirs, making one choir of over 500 voices. It has participated in the Cornwall International Festival for Male Voice Choirs a number of times and will be competing in the Bournemouth Festival in 2019. Stay in tune by joining the choir's newsletter.